Surrounded by the Pacific shoreline with its beautiful dunes and lovely beaches, Oregon’s Adventure Coast is located between the Oregon Dunes National Recreation Area on the North and Shore Acres State Park, an impressive botanical garden on a cliff overlooking the Pacific Ocean, on the South. 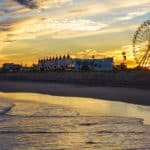 The area features a variety of outdoor activities including fishing, clamming, wildlife, bird watching, sea lion and whale watching, tours, cycling, and 4-wheel rides in the dunes. The Port of Coos Bay is an active commercial area. Here you can hike or camp along one of most scenic areas on the Oregon Coast, eat fresh takes on coastal cuisine and explore miles and miles of sand dunes — some reaching 500 feet high — at the southern entrance to the Oregon Dunes National Recreation Area. Or get to know Coos Bay better by visiting the museums that tell its storied past. It’s all up to you. Continuing reading our Coos Bay Travel Guide and start planning your vacation today. Average temperatures in Coos Bay vary somewhat. Considering humidity, temperatures feel cold for about half of the year and otherwise nice with a fair chance of precipitation about half of the year. If you’re looking for the very warmest time to visit Coos Bay, the hottest months are July thru September with highs around 68.8°F and rarely dropping below 53.7°F at night. 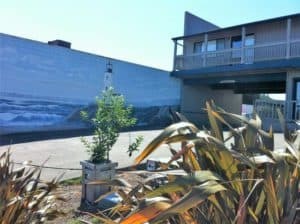 June thru August is the busiest season for tourism in Coos Bay, so lodging and other accommodations may cost more than usual. These months see the least precipitation with 1 to 4 days of precipitation per month. Cape Arago is located 12 miles southwest of Coos Bay and North Bend off Hwy 101. It stands 100 feet above the ocean on an islet just off Gregory Point. The light atop the 44-foot-high tower was first illuminated in 1934 and is easily noticeable due to its distinct fog horn. Although newest in terms of service, earlier structures were built on this site in 1866 and 1908, both succumbing to weather and erosion. Hidden behind a guarded fence, Cape Arago is not open to the public. This Oregon State Park preserves the former estate of Oregon timber baron Louis Simpson, combining historic structures, manicured gardens, natural areas, and ocean views into one must-see attraction. During your visit you’ll be able to stroll through acres of garden spaces, including several rose gardens, a Japanese-style garden, a garden pavilion, and a greenhouse. 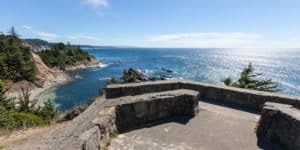 Hiking trails take you to stunning ocean viewpoints, where you can watch waves crash against the sandstone bluffs or enjoy whale watching in season. 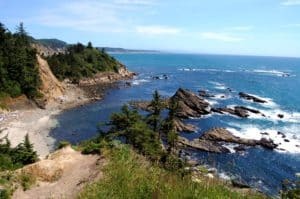 South of Coos Bay and off Highway 101, Cape Arago State Park has awesome rocky beaches perfect for hiking, beach combing, wildlife watching, wandering, and exploring. The north side of the cape provides views of Shell Island, a National Wildlife Refuge that is home to seabirds, sea lions and seals. Cape Arago’s South Cove has a nice stretch of sandy beach and a fine selection of tide pools. 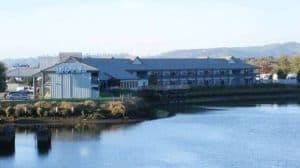 The Coos History Museum, operated by the nonprofit Coos County Historical Society (CCHS) in North Bend, provides information about the cultural history of south-coastal Oregon, emphasizing area residents’ traditional dependence on rivers, sloughs, and the sea. The museum’s collections include more than 40,000 artifacts, including an extensive assemblage of Coos and Coquille basketry, and more than 200,000 images, including the Victor C. West Maritime Collection. 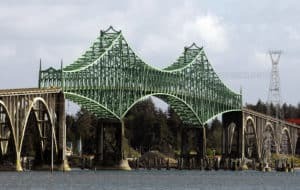 The Conde B. McCullough Memorial Bridge, is a cantilever bridge that spans Coos Bay on U.S. Route 101 near North Bend, Oregon. When completed in 1936 it was named the Coos Bay Bridge. In 1947 it was renamed in honor of Conde B. McCullough who died that year. Family run Benetti’s has unbeatable Italian cuisine with a warm, relaxed atmosphere. Located in a quaint Mediterranean-style villa and featuring a laid-back bar and lounge area, this is the perfect spot to enjoy some great Italian food and service. The dinner menu includes dishes such as seafood pasta, chicken parmigiana, calzones and house-crafted three-cheese ravioli. The Italian minestrone soup, in particular, has received rave reviews. Telephone: +1 541-267-6066 Web: Benetti’s Italian. Itty Bitty Inn is located in North Bend and features free bikes and a tennis court. This 5-star inn offers free shuttle service and free WiFi. All rooms are equipped with a flat-screen TV with satellite channels. The rooms in the inn are equipped with a coffee machine. Every room comes with a private bathroom with free toiletries and a hair dryer. All rooms will provide guests with a microwave. For more information, pricing or to reserve your room visit the Itty Bitty Inn. The Old Tower House Bed and Breakfast is central to Oregon’s bay area. Let them help start your adventure with a relaxing stay in an atmosphere that allows you to take it all in. If you are interested in seeing more of the Coos Bay area from the water, Captain Thomas is offering affordable fishing, crabbing, tours, and whale watching. For more information, pricing or to reserve your room visit The Old Tower House Bed & Breakfast. 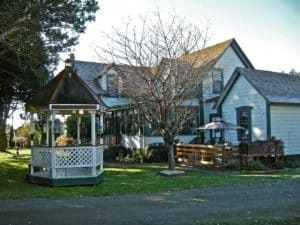 The Lighthouse Cove Inn is located 6 miles from Coquille River Lighthouse and 2 miles from Face Rock State Scenic Viewpoint. Free WiFi is included. 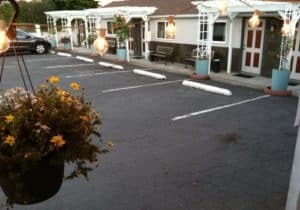 Guest rooms are equipped with a seating area, a flat-screen TV with satellite channels and a private bathroom with free toiletries and a bath. Selected rooms contain a kitchen with a dishwasher and an oven. All rooms will provide guests with a microwave. Guests at Lighthouse Cove Inn can enjoy a continental breakfast. For more information, pricing or to reserve your room visit the Lighthouse Cove Inn. With two bedrooms, a great bay front location, and a pet-friendly attitude, this cute and tidy Coos Bay vacation rental is an ideal home base for exploring the Oregon Coast! 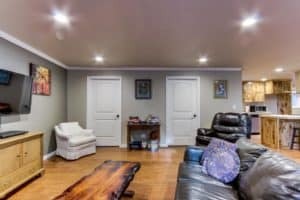 You’ll have an updated interior and amenities like WiFi, cable TV, and a gas fireplace. For more information, pricing or to reserve your stay visit the Seagate Cottage. This motel features an indoor pool, a fitness center, and a spa tub. Free breakfast and free self parking are also provided. Additionally, a business center, a meeting room, and laundry facilities are onsite. For more information, pricing or to reserve your room visit the Edgewater Inn. Amazing post! By reading this article, no one stop himself to spend some days here. Another highly informative article. Glad you enjoyed Amod, thanks for visiting beach travel destinations! I’ve never been to Oregon but it seems like a dream destination. It’sso useful to know all these facts about the place! Thank you for creating such a thorough article! You are very welcome Aspen. Glad you enjoyed my Coos Bay Travel Guide! Thank you for sharing this great information about Coos Bay Oregon. I was in Oregon about 3 years ago, and felt in love with this state. We drove all along the coast from San Francisco all the way to Newport Beach and the views are amazing. We are planning to come back maybe this year or the next one. But definitely visiting the Oregon Coast. September is probably when we are looking to go. Do you know what the temperatures are in September? The average temperature highs in September is 67 F and the average low is 50 F. It is a great time to visit, and you can also view the amazing whales migrating at that time as well. Thanks for visiting my Coos Bay Travel Guide. Thank you for this amazing post, I find it really interesting and cool, I have read about the Coos Bay and the area. I really enjoy this kind of vacation with so much beauty. The relaxation and luxuries that comes with it is what I am looking for 🙂 I am also liking the restaurants you have listed and the variety of cuisine. Do you think two weeks is enough time for me and the family to really enjoy the area? I’m a bit of a foodie and I love the variety in Washington and Oregon, and also all the seafood choices. I think that two weeks is a great amount of time for you and the family to have a really amazing vacation in Coos Bay. Please let me know if you have any additional questions. Coos Bay looks so great. In the near future, I will be traveling to Oregon. I am researching and planning right now. I just feel Oregon has many wonders of nature in another level and I will have a great experience. Coos Bay is of immense attraction to me. You have me excited to plan! No doubt you will enjoy yourself in Coos Bay Oregon and you are right, the nature experience there is awe inspiring for sure. 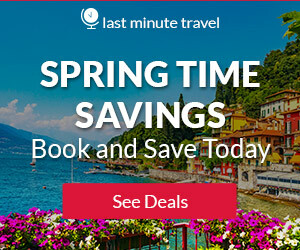 Please let me know if there is anything you need to get your trip planned. Hi Leahrae – this was a great post on Coos Bay. I was there once before, several years ago. Reading this brought me right back there. It is a beautiful place with lots to see and do. I did do the jetboat tour and wouldn’t definitely recommend it. It was a blast. Thanks for all the information on where to eat and stay. Would come in handy if/when I make my way back there. You are welcome Michele, I am glad I brought back some good memories for you and that you enjoyed my Coos Bay Travel Guide. Thanks for visiting beach travel destinations. Coos Bay looks absolutely stunning and I love the video you included in your post. Those little islands out in the sea look interesting but one will need a calm day to be able to reach them. The Oregon State Park definitely appeals to me. I love nature and also special gardens like the Japanese style garden or gardens full of roses which you mentioned. I would also like to visit the National Wildlife Refuge on Shell island but perhaps humans are not allowed there as to not disturb the animals. Going to new places I am very keen to try the local food so your restaurant list comes very handy. As a place to stay, I probably would choose the Old Tower house as older places have more charm. Thank you for this nice post. Thank you for reading my Coos Bay Travel Guide Taetske and I am glad you enjoyed. Please let me know if I can provide you with any additional information. Nice content! I love the way the ads are displayed, I enjoyed reading about the beaches and actually, since I am from Costa Rica, I know some cool beaches and amazing beaches, and Coos Bay is definitely a different type of beach scenery worth vacationing too. I’m adding the Oregon Coast to my bucket list! You do live in a beautiful country Maria! 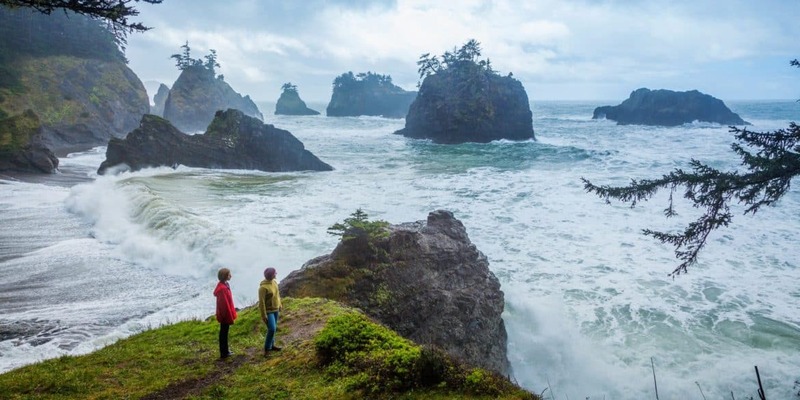 And you are right, visiting Oregon in the U.S. would be a great unique experience for you! Thanks for visiting my Coos Bay Travel Guide. Please let me know if you need any additional information. This for sure is very beautiful place to visit the video is leaving you wanting more of that beautiful and the Adventures looks endless in those waters. I am wondering if I will be able to see some marine life like dolphins and seals here? 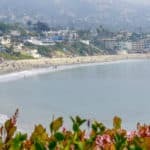 I have been looking into traveling to the west coast of the US. This looks like a great place, and you have provided me with all the information I need. Hi Charles, yes in Coos Bay you can most definitely see some marine life. I would take a boat tour out and that will of course increase your chances. Thanks for visiting my Coos Bay Travel Guide. 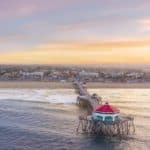 I have heard of Coos Bay on a few occasions from a couple of my surfing partners – apparently it was one of their many destinations several years ago. It’s really nice to put a picture/landscape to what they described – it really does look like a lovely part of the world. Do you know off hand if there are any surfing package deals offered in the area? Cos bay is a good destination for an adventurous holiday period its shore line wiyh beautiful beaches make it the perfect spot for a summertime vacation. As highlighted in your review I like the fact that there are lots of side attraction at the destination, lots of site to visit, there are never boring moments with such around.Also the lodging and accommodation options are also cool for different categories on their budget. I agree! Not a boring beach destination at all. There so much to do and take in here in Coos Bay, you won’t get bored and you could stay busy the entire vacation 🙂 Thanks for stopping by. 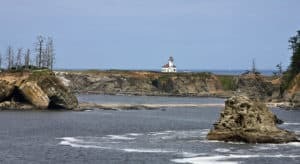 Another great travel guide post on Coos Bay. Unfortunately, I never made my way to this beach but I have heard some pretty amazing stories about it. Like certain times of the year you can catch perfect surfing waves, and other times you get thrown around like a crazy storm in the water. But it’s one of the most beautiful spots to visit according to my surfing buddies and one of their favorite spots to do ocean photography. I would agree with you! My aunt and uncle live there, and it is one of the most beautiful spots. You will have to visit some day soon! Thanks for visiting my Coos Bay Travel Guide. Oregon is on my list of states-I’ve-yet-to-visit and has been for some time. For some reason, when I think of Oregon, I think of trees. This other side of the state, around Coos Bay, gives me food for thought. How far is it from Portland or another airport with scheduled service? You are going to want to fly into Southwest Regional Airport which is the closest to Coos Bay (4 miles). The Portland airport is 173 miles away. Maybe a scenic drive ? Thanks for visiting my Coos Bay Travel Guide. I will say you left me jaw-dropped after I read the whole post. This is my first time see or hearing about the Coos bay and I am impressed by the description you wrote, most especially the amazing pictures you included, the description was nice. But what’s your view on having a honeymoon at Coos bay. Will it be nice for family vacations too? Oh my gosh, it would be a wonderful destination for a honeymoon. How great would it be to start your lives together in such an awe inspiring location. It is a safe place and free of the crime you see in other gorgeous destinations, making it a very family friendly destination. And it is pretty affordable too. Please let me know if you need any additional information.